The Alfa Romeo Tonale Concept is a strategically important product for Alfa Romeo; marks the Italian carmaker's debut in the electric-hybrid space. After making a stellar global debut at the 2019 Geneva Motor Show, the Alfa Romeo Tonale Concept makes its Italian debut at the ongoing 'Salone del Mobile.Milano'. 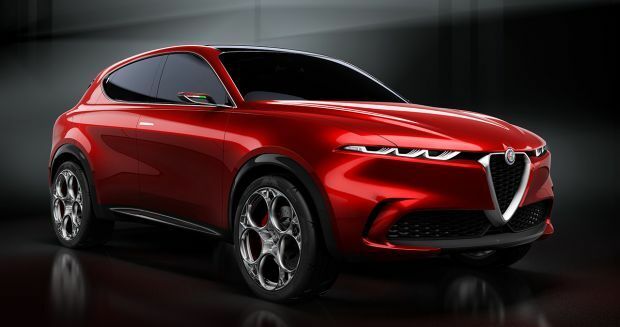 Well, from an SUV viewpoint, the Tonale Concept does not make much of an impact since the Alfa Romeo Stelvio takes the crown for being the brand's first-ever SUV. Then, what makes the Tonale special? Well, is the Italian carmaker's first-ever electric plug-in hybrid model, in the form of a compact SUV. This means that whatever electric tech makes its debut on the Tonale, it is likely to define the future electrification endeavours of the Italian brand. Unveiled at the 2019 Geneva International Motor Show, the Tonale Concept is certainly a true Alfa Romeo design. The 21-inch wheels take the design inspiration from the rotary telephone dial, which first saw its emergence on the 33 Stradale of the 1960s. At the front, the '3 plus 3' light clusters evoke the look of the SZ and the Brera. While not much is known about the car's final specs, reports suggest that it will feature a PHEV powertrain from the Jeep Renegade (with which its shares its entire platform), with a 1.3-litre petrol motor up front and rear-mounted electric motor. Like all recent Alfa Romeos, the Tonale is also expected to come with the firm's 'D.N.A.' Drive Mode Selector. However, all this is just speculation at the moment as Alfa Romeo is yet to confirm the car's specs. The Tonale is expected to make its commercial debut sometime in 2020.